After Boston Celtics guard Isaiah Thomas picked up his second foul in the opening minutes of Game 3, the Washington Wizards put him under attack. First, Wizards guard John Wall tried to back the 5-foot-9 Thomas down. Later, Otto Porter, at 6-foot-9, took Thomas to the post and twice scored easily. One by one the Wizards took turns trying to punish him in the paint in a game so physical that Thomas had his recent dental work knocked out. Of course Thomas will be OK, considering what he’s been able to overcome these past three weeks. His younger sister, Chyna Thomas, died in a car accident on April 15, the day before the Celtics’ playoff opener against Chicago. Thomas scored 33 points in the opener, but the Celtics dropped the first two games of the series. Boston has bounced back, and so has Thomas. After his high-scoring game the day after his sister’s death, Thomas flew to the Pacific Northwest to grieve with his family. Since then he’s taken two more cross-country trips, including the flight just over a week ago to Tacoma, where he delivered the eulogy at Chyna’s funeral less than 24 hours after the Celtics clinched the opening-round series over the Bulls. Wearing a black suit and dark sunglasses, he fought through tears as he addressed the crowd. The next day, Thomas had 33 points and nine assists, leading Boston to a 123-111 win in the series opener against the Wizards. In the next game, played on what would have been Chyna’s 23rd birthday, Thomas had one of the most memorable playoff games in Celtics history, scoring 53 points as Boston took a 2-0 series lead. It’s been more than grief for Thomas. His dental work resulted from an elbow knocking out a tooth in Game 1, and landing on his face in Game 2. 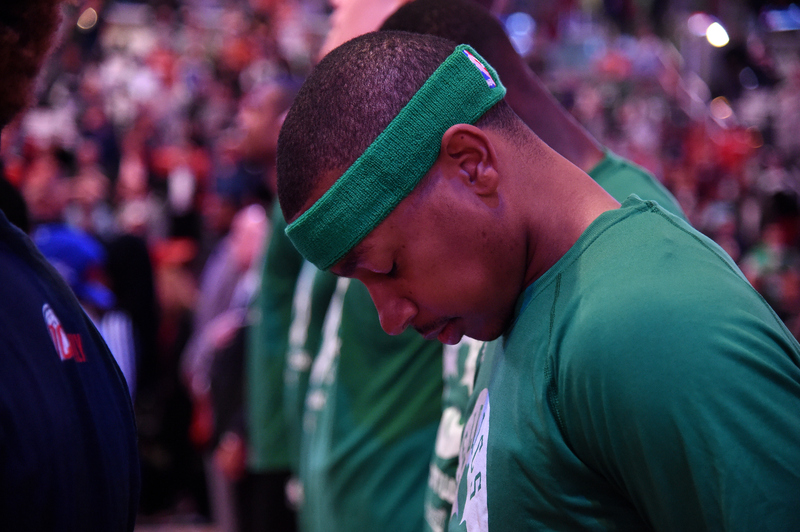 Isaiah Thomas #4 of the Boston Celtics stands for a moment of silence for the National Anthem before the game against the Washington Wizards during Game Three of the Eastern Conference Semifinals of the 2017 NBA Playoffs on May 4, 2017 at Verizon Center in Washington, DC. That led to six hours of extensive oral surgery on Wednesday, the day before Game 3, and five hours of dental treatment the next day. Thomas wasn’t on the floor at the start of the second half on Thursday because his four-piece temporary bridge was cracked in the first half and had to be replaced. Special is a trait Thomas has always possessed. At 10, Thomas had a skill level and confidence about his game that far exceeded his age. A highlight reel on YouTube shows that Thomas had a great deal of skill and maturity for a sixth-grader playing against inferior competition. Watching a young Thomas confidently nailing long jumpers, attacking the basket and showing flash while going behind the back to avoid defenders on the way to finishing layups, everyone who saw him knew he’d be special. By the time he was 12, Thomas was traveling around Tacoma with his best friend, 16-year-old Curtis Terry, and playing with older kids. That bond between the two led to Thomas gaining a mentor: Terry, who later played four years at UNLV, is the younger brother of Milwaukee Bucks guard Jason Terry. Curtis Terry would often have to vouch for his smaller friend when the two played area pickup games. When Terry later went on to star at Curtis High School, he’d bring Thomas with him when the team had Saturday practice. While the intent of the coaches would be to watch their kids play, their eyes often shifted to the secondary court to watch Thomas shoot. By the time Thomas arrived at Curtis he was extremely confident in his ability — and borderline cocky. As a sophomore he showed up at practice with a tattoo of the word “GOAT” written inside a coat of armor. 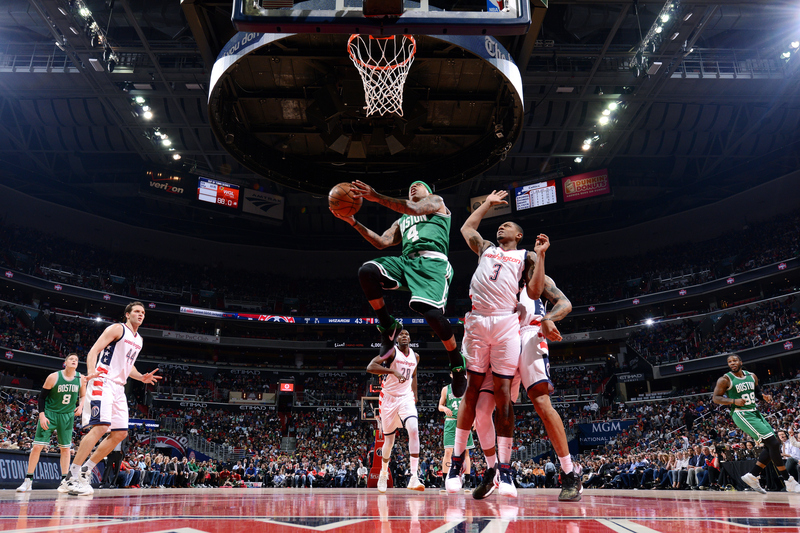 Isaiah Thomas #4 of the Boston Celtics goes for a lay up during the game against the Washington Wizards during Game Three of the Eastern Conference Semifinals of the 2017 NBA Playoffs on May 4, 2017 at Verizon Center in Washington, DC. Thomas wound up removing that GOAT tattoo as well. It was fake, but his growing legend in the Pacific Northwest was real. Opposing players taunted him, and when Curtis went on the road, student bodies serenaded him (one school repeatedly chanted “Gary Coleman, Gary Coleman …”). Thomas made everyone pay, demonstrating the same dead-eye jumper and attack-the-basket mentality that he shows today. As a sophomore in his first state tournament game, he wound up going 17-for-17 from the free-throw line. “I don’t think any of them hit the rim,” Bemis said. The next season he had the best game of his Curtis career, evading double and triple teams on the way to scoring 51 points in a loss to Franklin High School in the Tacoma Dome. With expectations high for Curtis the following season, Thomas shocked everyone by transferring to the South Kent School in Connecticut, where he focused on improving his grades so he’d be eligible for college. The coach at South Kent, Raphael Chillious, had been impressed by Thomas from the time he first saw him at the Nike Jamboree, a camp for the nation’s top ninth- and 10th-graders. “I saw a kid who was overly confident going against the top players in the country,” said Chillious, an instructor at the camp. “He was coming downhill every single time, in attack mode. That confidence was obvious during a practice drill not long after Thomas first got to the University of Washington. As then-head coach Lorenzo Romar went over defensive schemes where his players identified shooter closeouts and drive closeouts, he glanced at Thomas and asked which one was he. Asked his favorite Thomas story, Chillious offered two. The first came at a South Kent road game. Thomas was having a monster game, and the upset opposing fans began chanting, “We hate your dad, we hate your dad …” referring to the NBA legend, Isiah Thomas, who acts as a mentor. Chillious also recalled the time when Washington played at Washington State — Chillious was an assistant coach at the time —and Thomas had to urinate so badly late in a tight game that he could barely walk. Washington called timeout, but Thomas refused to walk to the restroom, which was so far away he would have missed part of the game. Coping with his sister’s death and his fractured teeth are more signs that Thomas will do whatever it takes to succeed. Asked whether he’s worried about requiring more surgery on his mouth if he takes another hit in this physical series, Thomas shook his head no. Basketball, in a weird way, has served as therapy for Thomas during these difficult times. Basketball takes him away from the idleness that might yield grief in dealing with his unexpected loss. That escape is coming during a series between teams with a brief history of bad blood, including a John Wall ejection for a flagrant foul against the Celtics in November and the Wizards showing up for a game against the Celtics in January wearing all black, a reference to burying Boston. Thomas, and his mouth, are likely to be targets in Sunday’s Game 4. But Thomas — coming off his least productive game of the playoffs, during which the Wizards tried continuously to post him up — is not worried.